Times: 12 PM - ? This event is free and open to the public. Everything kicks off at noon and fun lasts all day! Located in the big shelter house on the hill at Cole Street. 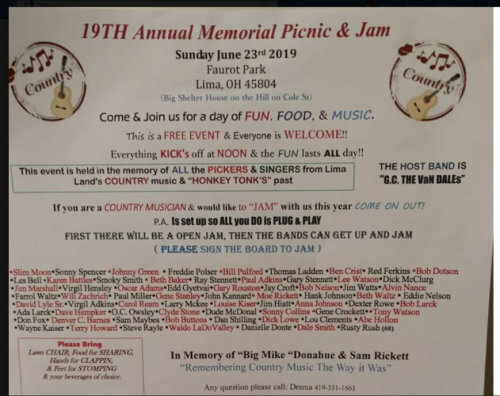 This event is held in memory of all the pickers and singers from Limaland's country music & "honky tonk" past. If you are a country musician and would like to jam with us this year, come out out! Sign yourself up on the jam board and the P.A. is set up so all you do is plug and play! The open jam session will take place first, then the bands will perform. Host band is G.C. The Van Dales. Bring your lawn chairs, food for sharing, hands for clappin, feet for stompin, and your own beverages of choice.